The sudden taste in decorating walls seems to be a counter-reaction to all those years of responsible minimalism. Away with all that Zen boredom and neutrals, now it's fun to be at home again. Toss all those Feng Shui books in the trashcan and cover the living room in Tweety wallpaper. Rainbows, butterflies, and child-like flower patterns are another possibility. This is more of a political statement than the proof of flawless, aesthetic taste. Dutch artist Lily van der Stokker has been making fun of the international art world's rigid self-gravity for years. 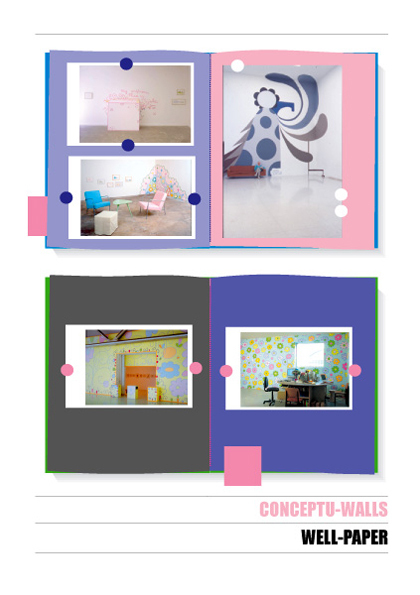 She fills museum walls with cheerful children's room patterns. It's only now that van der Stokker is getting the international recognition she deserves. The latest homage to Lily comes from Viktor & Rolf, Holland's best-known fashion designers, who have translated her colorful flower patterns into their striking men's wear for next summer. Lily Van der Stokker Friends & Family, Consortium, Dijon (15/06/2002 - 14/09/2002). Flower background wall painting with guests, 2000-2002. Au-delà du spectacle, Centre Pompidou, Paris, 2000.